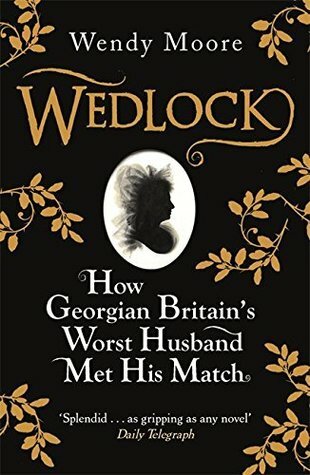 This week I’m featuring Wedlock: How Georgian Britain’s Worst Husband Met His Match by Wendy Moore, a library book, that my friend recommended to me. Settling down to read his newspaper by the candlelight illuminating the dining room of the Adelphi Tavern, John Hull anticipated a quiet evening. Having opened five years earlier, as an integral part of the vast riverside development designed by the Adams brothers, the Adelphi Tavern and Coffee House had established a reputation for its fine dinners and genteel company. It should have proved a memorable occasion, summoning up reminiscences of the royal wedding just six years earlier. Yet by the time that Mary walked down the aisle of St George’s Church in Hanover Square, splendidly robed in her silver and white wedding dress, on her eighteenth birthday on 24 February 1767, her teenage infatuation was over. She knew she was marrying the wrong man. Described by the Daily Telegraph as ‘ Splendid … as gripping as any novel’ this is non-fiction, the biography of Mary Eleanor Bowes who was the richest heiress in 18th century Britain. She fell under the spell of a handsome Irish soldier, Andrew Robinson Stoney. When Mary heard her gallant hero was mortally wounded in a duel fought to defend her honour, she felt she could hardly refuse his dying wish to marry her. Totally sounds like a fun book for me to read!!! I’m not at all sure this will be a fun read! Oh, this is tempting, Margaret. An intriguing story, a historical context, and I like the writing style. I hope you’re enjoying it, and that you’ll post a review. Thanks, Margot – it does look intriguing. Oh I want to read this one! It sounds fascinating and I love the narrative voice! I think so too, Katherine. This does sound tempting. I hope you enjoy it. The week I am featuring Little Girl Gone by Gerry Schmitt from my TBR mountain. Happy reading! This is nonfiction? Amazing title. I want to read it just to find out how he meets his match. Sounds so very good. I really dug into the 56! Happy weekend! “She knew she was marrying the wrong man.” Well, with that, I’m hooked. Thanks for sharing! I like the subtitle! From the excerpts provided here, it seems that the sentences are fairly long and that the author likes subclauses (I hope that this is the proper term) such that this is a book that one cannot read very quickly. I look forward to your review. I can’t stop looking at her hair! LOL I hope you enjoyed it. Great start. Sounds like a very good story. I will put it on my to read list. I love historical fiction and it seems there is nothing to put you away from this genre in the beginning.